Jane Carr (Treadwell, NY) is a painter of landscapes in egg tempera on panel. 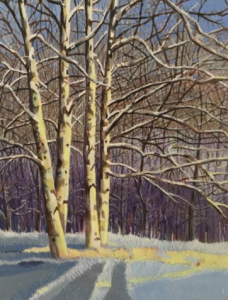 She paints the area where she lives, the northwestern edge of the Catskill Mountains in Treadwell. 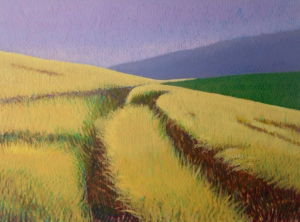 Carr uses the jewel-like quality of egg tempera color to catch the effects of light and atmosphere in the long hollows of the western Catskills, and is particularly interested in how landscapes are altered by farming, animals, buildings, and weather. 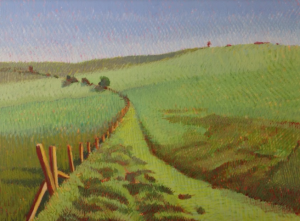 She often includes antique farm machinery, local buildings, and animals in her paintings. She works from sketches, photographic reference, and quick watercolor studies. Carr has been painting for more than 50 years, and her first invitational show was in 1966 at the John Slade Ely House in New Haven, CT. Jane Carr is a member of the Society of Tempera Painters, The Hamilton Street Club in Baltimore, The GNAF Society, The Cooperstown Art Association, and the Upper Catskill Community Council of the Arts, and is an artist member of The Smithy Pioneer Gallery in Cooperstown. Website: www.janecarrstudio.com. Show closes November 23, 2018. $3 suggested donations. Students are free.